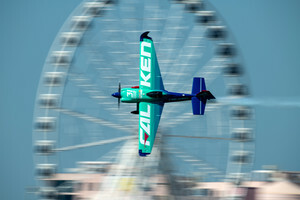 On 8 - 9 February 2019, the pilots of the Red Bull Air Race will once again will be cleared into the track to kick off the season in Abu Dhabi. For the 12th season in a row, the stunning blue waters of the Corniche will set the scene for the action-packed season opener and a brand new World Championship. Brageot, Goulian, Hall and Sonka still to fly. Muroya, McLeod and Velarde currently holding the top three spots in the Qualifying timesheets. I think the points are an exciting element to Qualifying... it's not just 'hey, who am I flying against tomorrow?'. The reality is that in the track out there I'm just trying to go fast. Second turn into the track and Brageot is in at 200kts... fast through the chicane and he's picked up+1s for Over-G at Gate 3... just too much aggression. Brageot seems to be pulling too hard and needs to relax a little through those racing lines, thought there's definitely more to see here. Luckily for Brageot his first run counts and he's sitting pretty in 3rd as Goulian, Hall and Sonka prepare to fly. We're back in the hangar, Matt is on the way to the track - thanks to all our Aussie fans who are still awake, it's 12:08am AEDT right now! Also a shout out to our friend Lara, air race misses you! Goulian into the track. Goulian took the win in Abu Dhabi last season and we know Goulian has got a lot in the tank as we see a slightly conservative performance from the American pilot. Still, his time is solid and Goulian has definitely got a banker there. No penalties and great style... but he's got some time to find in the VTMs. He goes into third with 53.400, 0.3s behind Muroya. Sitting here getting as promised Matt go go go your german fan, Tina. Goulian cleared into the track for his second and final run of the day in Qualifying. Goulian through the chicane and it's very tight and clean, and through the first VTM cleanly... it looks more aggressive and the light goes green, but Goulian has got to retain his focus... but NO! The buzzer sounds and it's +2s on the clock and AGAIN... another +1s and Goulian seems to have slipped up by rolling over through the gate. Otherwise Goulian's times are looking really healthy and he's in a good spot for the head to heads tomorrow. His first run time stands and he stays in 3rd place overall. Hall into the track at 199kts... he said he was hurt badly by relaxing too much on Race Day last season, but with extra points up for grabs here in 2019 will we see a super competitive Hall in Qualifying? Sweet Run #24 " Super Ben "
Hall into the track for his second run in Qualifying. 199kts and the pressure is on to get into a much better position for the head to heads tomorrow... he seems to have tightened the lines in the chicane and we're already seeing the payoff as his times are already significantly improving. Faster and tighter in the VTM... but the pace is just lacking out there. The split times look significantly slower in this second lap so could it be pilot or plane as Hall moves up to 7th place overall. Defending World Champion Martin Sonka is cleared into the track. Well done Matt so tomorrow give your BEST !!!!!!! Sonka into the track with 199kts, through the chicane and soft pull into the VTM as Muroya's ghost plane is ahead... Sonka still looking fast but his VTMs are not as tidy and tight as Muroya's. Sonka penalty free and quick but he's unable to chase down Muroya in the second lap... he retains in 4th place overall and that's Qualifying done and dusted as Muroya takes the Qualifying win! Yoshi did a Great Job! We hope that yoshi will win the championship!